John and Elida Berg were Swedish immigrants who, as newlyweds, were able to find a home and a new life in Seattle. In 1910 John and Elida built a house on 29th Ave NE at NE 68th Street, just south of Wedgwood Rock which is on 28th Ave NE at NE 72nd Street. In those days it was called Big Rock, because the name “Wedgwood” for the neighborhood did not yet exist. The area around Big Rock from NE 70th to 75th Streets was untouched and undeveloped; there were no streets put through around the Rock. The content of this article is protected under a Creative Commons Copyright. Do not copy text or photos without permission. The Alaska-Yukon-Pacific Exposition was held on the campus of the University of Washington in 1909. The year 1910 dawned cheerfully in Seattle, as the city was still patting itself on the back for its highly successful world’s fair held in 1909. In preparation for the Alaska-Yukon-Pacific Exhibition, Seattle had rushed to make many improvements in streets and utilities. It all seemed worthwhile as the fair was well-attended and Seattle’s economy had been brisk during the AYP’s 138 days, from June 1 to October 16, 1909. At the conclusion of the AYP on the present site of the University of Washington, the campus was left with a design layout and some permanent buildings. Some of the exhibition buildings at the AYP were temporary and were torn down after the fair. John Berg was one of the carpenters hired to disassemble some AYP exhibition buildings in the autumn of 1909, and as part of his work, John was allowed to take building materials for his own use. It is likely that he was assisted by Martin Sundstrom, a fellow Swedish immigrant who was married to Tillie, one of John’s older sisters. John and Elida Berg 1909 wedding photo. All rights reserved; do not copy. John Berg had been in Seattle about five years when he met the love of his life, Elida, also a Swedish immigrant. They met when both John and Elida were living with relatives on Seattle’s Capitol Hill, in houses near to one another. 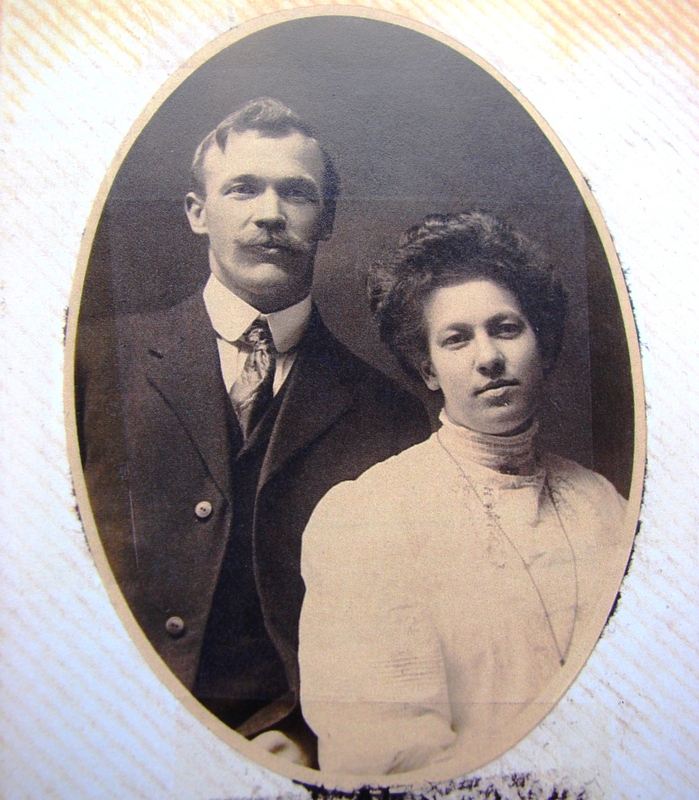 John and Elida were connected by “relatives by marriage.” When she arrived in Seattle Elida lived with her Uncle Martin Sundstrom, whose wife Tillie was John Berg’s older sister. John & Elida married on May 15, 1909 and by 1910 they were expecting their first child. John and Elida were eager to do nest-building, and with the materials which John took away from dismantling of buildings at the AYP fairgrounds, he was able to build a house where he and Elida could raise their family. The Berg’s house at 6823 29th Ave NE was just outside the northeast Seattle city limit of NE 65th Street. The area was called Ravenna and was semi-rural, with no electricity or city water. House lots out north of NE 65th Street were outside of the city limits and cost less. Because of this, and because of the free building materials brought from the AYP’s dismantled site, John Berg was able to build his house at little cost. The Berg’s house, 6823 29th Ave NE, as it looked in the Big Snow of February 1916. The Berg’s house was completed in 1910 and was one of three houses clustered together: a similar house next door at 6815 29th Ave NE, and one behind them at 6814 28th Ave NE. The house at 6815 29th Ave NE was completed in 1909 and the owner was a single woman, Burnie Woodruff, who had been teaching at Green Lake School. In the same year that she moved into her new house, she began teaching at the Ravenna School which was within walking distance. In the cluster of three houses, 6814 28th Ave NE, owned by Martin Sundstrom, was finished in 1909 and was likely the first of the three to be completed. Probably John Berg had worked on it with Martin Sundstrom and then started on his own house, completed in 1910, on the adjacent lot. Including the house belonging to Burnie Woodruff, these three houses were the first to be built on that block. The three houses may have been clustered together because they were all drawing from the same underground water source. The three houses may have shared one well, because there was no city waterline. 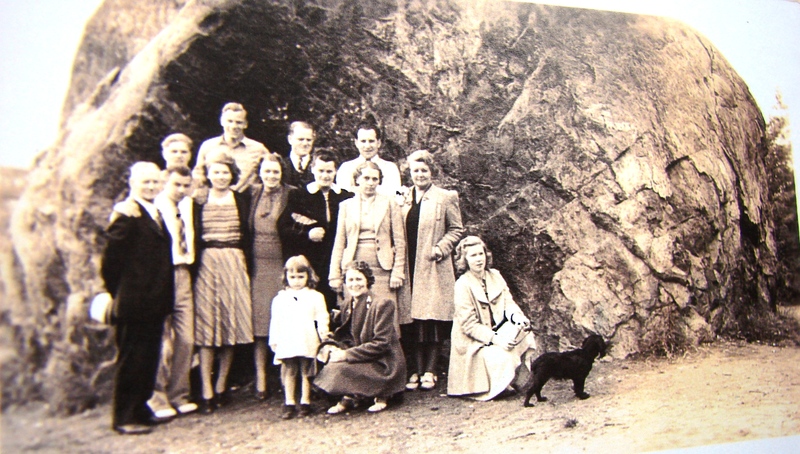 Big Rock, as it was then called, was the site of many Berg family picnics and photos. Photo courtesy of the Berg family; all rights reserved, do not copy. Address listings in the Seattle City Directory show that Martin Sundstrom never lived in his house which was back-to-back with John and Elida Berg’s house. The reason is probably because his wife, Tillie, died in 1911 and Martin Sundstrom then changed his plans of where he would live. John Berg was able to acquire the house for another one of his sisters, the widowed Mary Kallgren. 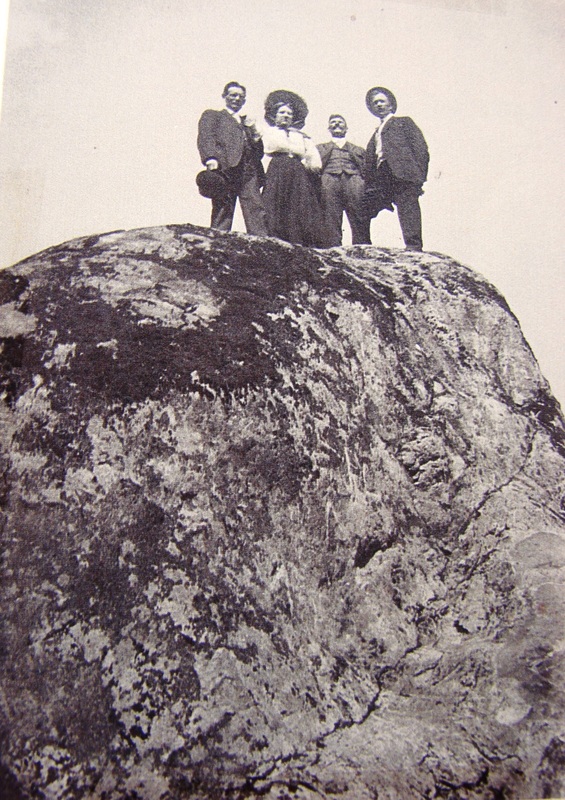 The Berg and Kallgren cousins grew up together and one of their favorite playgrounds was the nearby Big Rock. The Rock at 7200 28th Ave NE was the site of many family group photos, picnics and outings. In the 1920s and 1930s Big Rock became the practice site of the developing sport of mountain-climbing, with Scouts and Mountaineers trying out their skills. The years of economic hardship of the 1930s were especially difficult for the Berg family as John Berg developed Parkinson’s disease and became unable to work; he died in 1938 at age 59. One of the Berg daughters had married in 1937 and the other three Berg children, ranging in age from 18 to 28, lived at home with their mother Elida, and they all worked to contribute to the household income. After the Pearl Harbor attack of December 1941 which caused the USA’s entry into World War Two, the three unmarried Berg children, a daughter and two sons, all entered the military. In 1940 the Berg family did not know that a world war and a future housing development would completely change Big Rock and would change their way of life. Just as World War Two swept away the old world order and things were never the same again, the 1940s also brought the end of the Big Rock era. The Miller family who had held the Big Rock property since 1889, sold it to Albert Balch, the developer of Wedgwood housing. The Berg family’s playground with big trees and a Big Rock had been a quiet, forested area, but in the 1940s it became noisy with construction. By 1945 streets were being put through and Big Rock became Wedgwood Rock, surrounded by Balch houses. Alaska-Yukon-Pacific Exposition: Washington’s First World’s Fair. HistoryLink Publishing, 2009. Alan J. Stein, Paula Becker & The HistoryLink.org Staff. All photos courtesy of Berg family descendants; used with permission. The content of this article is protected under a Creative Commons Copyright. Do not copy text or photos without permission. Chain of ownership of the Wedgwood Rock land: the first homesteader to claim the property was William Weedin, a Civil War veteran from Missouri who came to Seattle in 1873. We have a record of a Fourth of July picnic at the Rock in 1881, in a letter to the newspaper written by one of William Weedin’s neighbors. In 1889 the Miller family bought the forty acres of land which included Big Rock, and held it until selling the property to Albert Balch in the 1940s. Wedgwood Rock as it looks today. Photo by Valarie. This entry was posted in Houses, Immigrant heritage, Wedgwood Rock and tagged AYPE of 1909, Seattle, Swedish immigrants. Bookmark the permalink.